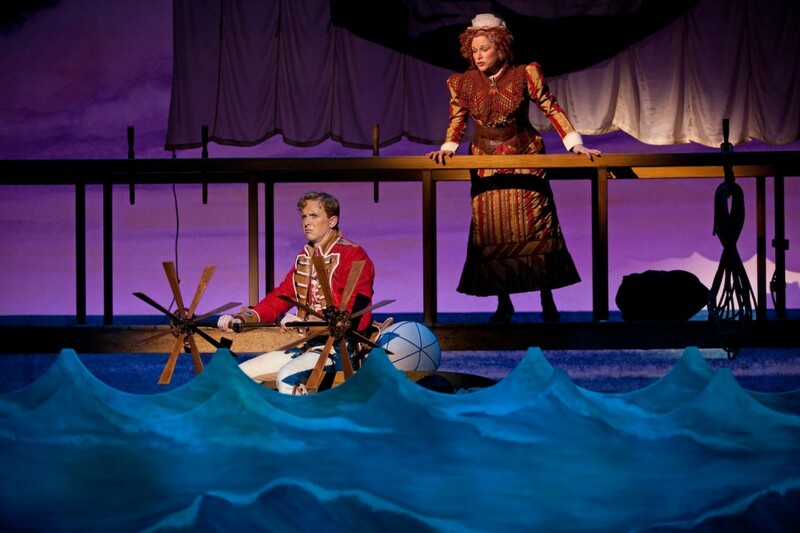 I haven’t seen the full season of Stratford Festival fare yet but The Pirates of Penzance is one of very few things so far that’s thrilled me. I loved it. I went in fond of but aware of the flaws in Gilbert & Sullivan’s work, and specifically the technical insanity of trying to stage Pirates. It’s a tall order to ask a modern audience to sit through 3 hours of operatic voices (meaning, impressive but distancing and hard to decipher), implausible plots, terribly silly lyrics and predictable formula outcomes. I know The Stratford Festival has had success with G&S in the past but I had no idea how director Ethan McSweeney was going to make this work. I should have known better. He won the 2010 My Theatre Award for Dangerous Liaisons (to this day, one of my favourite Stratford productions ever) and his head is full of problem-solving, re-inventing brilliance. McSweeney sets The Pirates of Penzance as a play-within-a-play, giving the hammy acting, goofy costumes and overwrought vocals the operetta requires a knowing wink of self-awareness. The stage is dressed as a backstage as we see the actors warm up and prepare (a corset is tightened, a stage manager aggravated, a secret handshake shared between costars). As they run towards the stage lights, the actors reverse direction and we become the audience-within-the-play watching “The Pirates of Penzance”-within- The Pirates of Penzance (does that make sense?). It’s a brilliant device, especially if you’re working with a flawed text, and it does the production wonders as it moves in hilariously goofy directions. The cast embraces the goofiness to great effect but they never forget to play the honesty either, making sure that Frederic’s betrayal of Thomas (The Pirate King) stings and Mabel’s love feels real.Sean Arbuckle is particularly fantastic as The Pirate King. 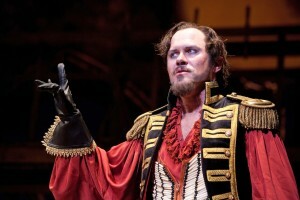 It’s the best role in the text (especially if The Modern Major General is lackluster, which he absolutely is here, even messing up his iconic patter) and Arbuckle completely steals the show with oddball verbosity, grandiose showmanship, amusingly inconvenient morality and heartrendingly lovable thin skin. Kyle Blair matches him almost awesome moment for awesome moment. His voice, first of all, is fantastic and serves him well in Frederic’s seemingly endless love ballads. He’s sweetly awkward enough to make us love him even when he’s vowing to take down his pirate friends minutes after leaving their employ and breaking the poor Pirate King’s heart. With a comical stick up his bum, Frederic easily casts aside his old nursemaid Ruth and moves on to the prettiest girl he can find. 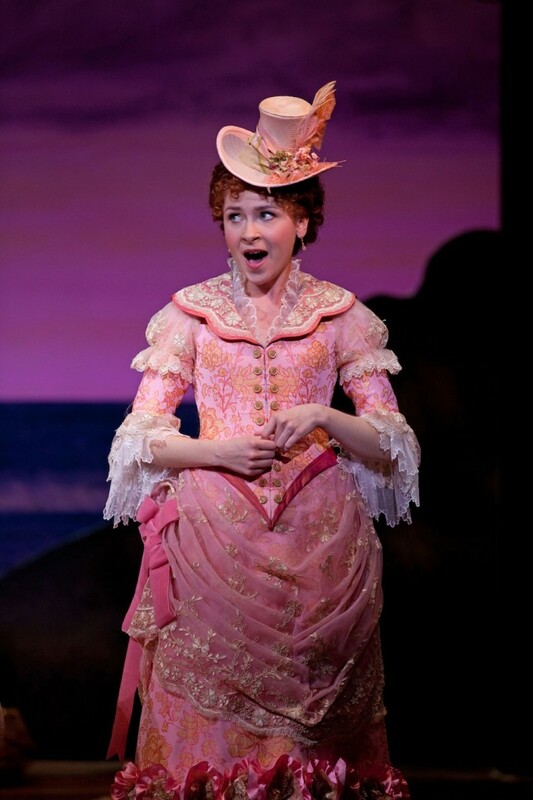 Luckily, that girl isn’t the usual dumb soprano Mabel but rather Amy Wallis’s feisty, amusing soprano Mabel. The two have enough chemistry to sell the crazy speed of their intense courtship and their voices blend beautifully. Wallis’s high soprano fits far more perfectly here than it does in Charlie Brown and she leads a great female chorus by being completely not annoying (this, I’m sure you know, is an Amazing accomplishment for a G&S soprano). Naomi Costain is greatly amusing as Mabel’s tough eldest sister Edith and I loved the scheming dishonesty in their protests to their father on the topic of those pesky courting pirates (the hoity-toity girls are All Over that band of harmless misfits). Steve Ross and his ensemble of slapstick police officers are a bit boring in their silliness but the Arbuckle-led chorus of pirates more than makes up for the police as they quirkily take on the world one glass of sherry at a time. The opening number is particularly rousing (and fantastically choreographed by Marcos Santana) and it leads to all sorts of charming fun to come. If you’d asked me when this season was announced if there was any chance The Pirates of Penzance would be my favourite, I’d have told you that’s as crazy as someone mistaking the word “pilot” for “pirate” and enrolling a baby boy with the closest band of swashbucklers. But this is G&S after all, nothing is too crazy to be true. 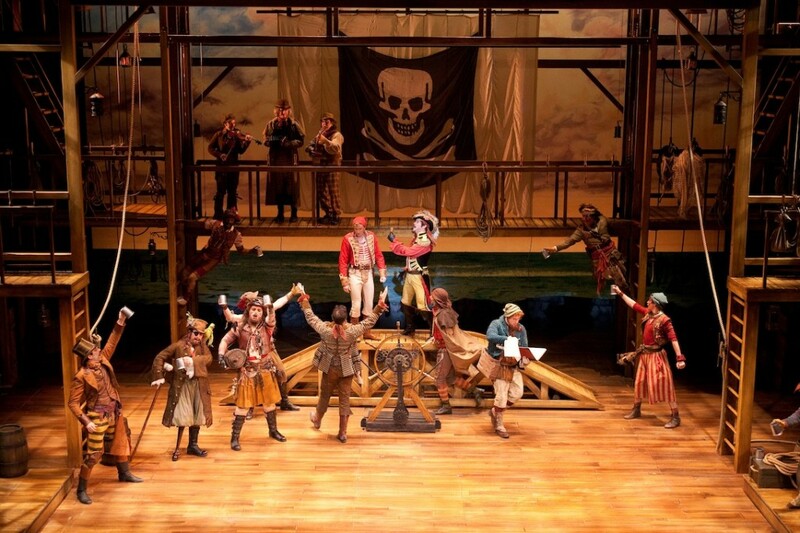 The Pirates of Penzance plays at Stratford’s Avon Theatre until October 27th.